At 11:30 AM, July 20th, Richard Roberts and Nicky Patterson stood proudly on the West Summit of Mount Elbrus, the highest summit in continental Europe. 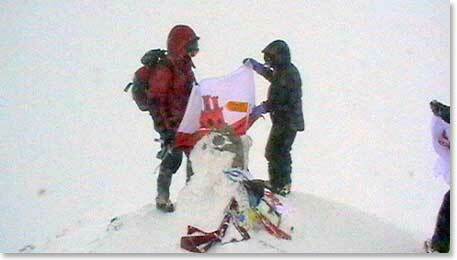 Richard and Nicky were the second BAI team of this season to stand on the summit of Elbrus. They reached the top with their Berg Adventures Guides Vladimir Bakhmutov and Karina Mezova. We congratulate them and we proudly pose this question: Has anyone besides Richard and Nicky ever unfurled a Gibraltar Flag on the summit of Mount Elbrus?